Elon Musk, a man who has crazy work ethics and always striving for his goals no matter what the risks are or what consequences it will have on him or his family . He has gained a title of the Paypal Mafia and is also one of Silicon Valleys most respected entrepreneurs . Personally reading this book has increased my respect towards all entrepreneurs famous or yet to be . This book really details out greatly on how Elon Musk started his journey towards success from Zip2 to X.com and soon Space X and Tesla , impacting me almost immediately as I slowly started to think out of the box just like how Elon did when having such startups . With his crazy work ethics he have made me strongly have faith that whatever sufferings I have now will ultimately lead to a long time success just as how he categorized each investment he makes , long term or short term . Besides I am also flabbergasted by all his ideas that he have come up with , some of them people just could not even knew that they would have needed it until he invented it just like how he did with the electric car . Taking huge risks were also always in his agendas as he was almost bankrupt once and his only option was success as if he failed this he would have nothing left for himself . Besides one of his most honorable traits were that he was extremely great at coping with massive amounts of stress and pressure as he had crazy work ethics and this blows me away .All in all ,nothing could literally stand in his ways to block him form achieving his goals and that was what inspired and blows me away.He was just a man with a plan no matter what the circumstances were. Reading these book which has accounts from previous employees from space X and Tesla I could also tell that although most people see the bright side of Musk , there was this dark side of him that not many could have known as it was usually not published that frequently . He was a man that was also known to have worked all his workers to the bone , such as making them work almost the 22 hours a day or even till the extent of not being able to go back home to meet their families . This was especially saddening though workers who usually just express themselves because of such things were thrown out of the company like garbage although they have done so much for the company . Sometimes to if an employee have an idea that was going against Elon's initial idea they too might get fired just in a matter of seconds. In conclusion I really enjoyed reading these book as it has great insights on one of the leading technological company that may soon takeover the world . It has also opened my eyes to see some bad politics and disputes in such big company that has changed my perspective of such companies . 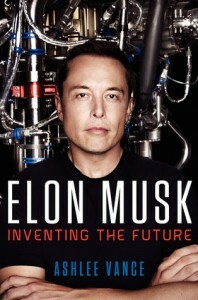 Other than that I would also like to recommend this book to any aspiring young entrepreneurs out there so you will have a greater understanding of what it is like to run such businesses so you will not buckle under immense pressure as Elon is also well known for making fast and effective decisions although he was under great pressure .